The agriculture industry needs to keep up with how fast the rest of the world is moving. Most nations that depend on agricultural products as the bulk of their GDP are low-income. Mankind’s survival depends on agriculture, so it’s important that this sector flourishes. One of the ways it can do so is through the application of cutting-edge technologies, particularly artificial intelligence. Although AI, to its full extent of self-aware machines, is not yet a reality; but machine learning is. Machine learning is a sub-type of artificial intelligence where systems can learn from experience and improve without the need for reprogramming. 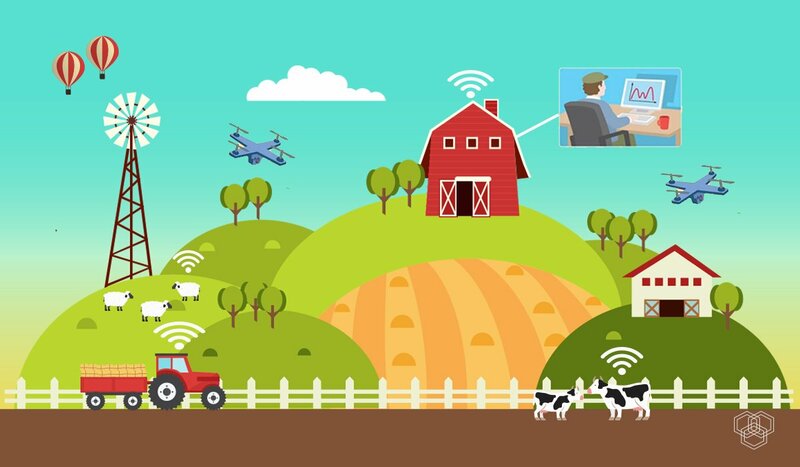 Almost all of the advancements surrounding agriculture are some form of machine learning. A productive agricultural system depends on achieving maximum yield with minimum resources. Efficiency and productivity could be considerably enhanced using technology. Innovative methods that track weather patterns, soil health, ideal harvesting times, pest control, and find ways to use less land and water will be the keys to making agriculture more productive. As we stand on the cusp of climatic disaster, humanity needs to make this a reality soon. Technology like AI and machine learning can be applied in a variety of ways to boost the efficiency of food production. For example, it could wean crops off of chemicals like organochlorines (currently used for killing pests). A feat like this is already in humanity’s sights thanks to biotechnology and genetic engineering. However, biotech companies tend to make patented seeds that need to be bought from a specific company every year. Genetically modified and patented seeds are therefore often too expensive for farmers in poorer countries to afford year after year. Machine learning technologies can work around this and rid the world of chemical pesticides once and for all. Although these (and future AI advancements) are also expensive, they may still be more economical because they do not need annual replacements (though they will need upgrades). Food security is one of the most pressing concerns plaguing the world today. Modern innovations have brought food production to new heights, yet a large proportion of the world’s population goes hungry. We don’t simply need more food, we also need to make sure it’s accessible to a greater percentage of the global population, and artificial intelligence can help there as well. Artificial intelligence is rapidly finding firm footing in agriculture. Since nature can be unpredictable, a system that can make intelligent choices after immediately adapting to a new situation is a game-changer for the industry. Large-scale farming usually depends on hiring a large team that has to continuously monitor crops. In-depth imaging and analysis using drones have led to “precision farming.” Drones can enable crop monitoring and field scanning methods that are much more effective. The data these drones generate is digital because these are images from a camera. These images can show growers how tall the plants are, the color of the plants, the temperature, humidity, soil conditions, etc. AI can simply convert the digital data into a statistical spreadsheet or a graphical form that compares it to historical data. Combining the photos with chemical and physical monitoring of the soil can provide vital data the allows to swift response. This will help farmers in eventually ending up with optimum yield. Artificial intelligence can also incorporate image recognition software to detect diseases in crops. Early diagnosis of what is wrong with a seemingly healthy crop is essential as farmers can prevent a disaster if they are warned of a problem early on. An expert in botany or a farmer familiar with the disease morphology of a plant can tell if the plant has a certain disease by looking at it. Image recognition software uses a camera image to identify what disease the plant might have. It goes a step further to also identify if a plant is being exposed to stress in its environment. The German company PEAT has turned image recognition software into a mobile app called Plantix. A smartphone camera photo of the plant can generate a diagnosis. Someone without the knowledge of what a diseased plant looks like can now hold their smartphone camera to the plant and use Plantix to identify what is wrong with it. Another area for AI to considerably affect agricultural efficiency is in improving the accuracy of weather forecasting. If farmers can predict the weather, they can make decisions accordingly. One of the most impressive innovations in this area is aWhere. Based in Colorado, this organization uses machine learning to give localized tips to farmers. aWhere can forecast weather and also predict patterns in the agricultural market so farmers have a better idea of the most competitive selling prices of their produce. In the future, farmers who can incorporate robots capable of machine learning to carry out additional agricultural tasks will be at an advantage. Human workers can carry out agricultural tasks but robots equipped with AI software can perform tasks like getting rid of weeds with far more precision. Machine learning can enable a robot to identify weeds within a crop and effectively spray only the weed. The robot “See and Spray” by Blue River Technology does exactly that. Another potential application for robots with AI is harvesting crops and identifying ripe produce. Harvesting crops requires an enormous amount of manpower, and companies are now developing ways to get robots to do it more rapidly and effectively. A great example is Harvest CROO Robotics. They have developed a robot to assist strawberry farmers. Once optimized, it can be extended to more crops. Agriculture around the world uses massive amounts of freshwater reserves to irrigate farmland. However, the real concern here is the sloppiness of manual irrigation and the amount of water wasted. Conservation of freshwater sources is an urgent matter due to global warming. AI can rein it in through automated irrigation and help narrow down the precise amount of water needed. Farmers can therefore make informed decisions around irrigation. ConserWater has made amazing breakthroughs in this area. This startup helps farmers assess exactly how much water a certain patch of agricultural land would need. It works directly to reduce freshwater waste. Artificial intelligence has massive potential to change the face of agriculture, potentially helping to curtail extreme poverty and the effects of climate change. Facilitating the integration of artificial intelligence into the field is vital to its success.